Let Bronte whirlpools and spas take you away from the rigours of everyday life. Bronte offers you a lifetime of luxurious bathing pleasure; relax, and indulge in the sensation of gentle yet invigorating massage. 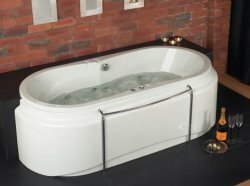 Bronte have been crafting superior whirlpool systems in the Yorkshire Dales for over 20 years. Inspired by the landscape around them, their fusion of clever engineering and contemporary design brings you everything you need to turn your bathroom into your own personal oasis. 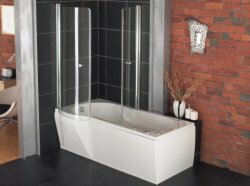 Most of the Bronte Whirlpool bath range are available at Newport Bathroom Centre so please telephone us on 01633 262629 for our latest brochures, prices and offers. 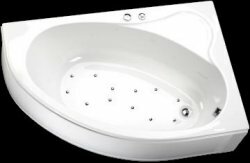 A Bronte whirlpool offers zoned massage from jets set into the walls of your bath, and those jets can be angled to provide relief where it’s most required. Each set of jets has its own controls, enabling you to regulate the amount of air mixed with the water: the more air, the greater the massage effect. We offer the choice of manual or electronic controls to do this for you. We also offer the choice of up to 8 side mounted jets and up to 4 jets at the head and foot. The Trona is classically designed to be the pride of any bathroom. Featuring clean and simple lines, and with integral armrests, Trona is the ultimate in understated elegance. The Original controls offer enjoyable, high-quality Bronte whirlpool and spa experiences at down-to-earth prices. 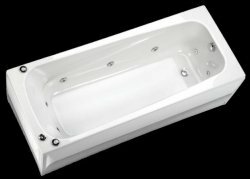 Jets - 6 directable body jets set into the sides of the bath. Controls - push-button manual on/off control & easy-turn massage power control. 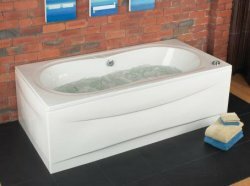 The beautifully sculpted Taos is a bath built for lying back and relaxing - whether you want to stretch out on your own or play footsie with your bath-buddy. Featuring a large tap platform and integral armrests. The Taos is available with the Vogue Elite Sytem featuring: Electronic controls, bringing a range of features which are not possible with manual controls; these include a unique pulsing massage programme, continually cycling the power from low to high for the most luxurious massage this side of Sweden. Bronte spas feature 12 or more jets built into the base of the bath only. These deliver streams of warm air bubbles, rather than a pressurized mixture of air and water, to give you a genuine ‘bubble bath’. If you’d like the best of both worlds whirlpool & spa, why not choose a combination system? This will include whirlpool jets built into the bath walls as well as spa jets fitted to the base. Make a design statement - and the best use of space – with the Azure. This is a popular classic, an offset corner bath with a generous bathing area; lie back, relax, and let the jets carry your cares away. Amazingly versatile, Magenta is small enough to fit most bathrooms, turns your bath into a shower whenever want, and offers super luxury. A silver front shower screen is available, which opens out for easy access and folds away when not in use, and an optional back-to-wall screen completes the full shower cubicle. Make the best use of your space and your time, with Magenta. Whichever system you choose, you’ll always feel warmer in a Bronte bath. Not only are our bath walls thicker, retaining more heat, but the fact that the water is continually moving cancels the ‘wetsuit’ effect. This effect means that in a conventional bath, the thin layer of water in contact with your skin will cool down to approaching body temperature. A whirlpool or spa prevents this layer from building up, so it keeps you feeling warmer and saves energy, because you won’t feel a constant need to ‘top-up’. The Jacinto’s sweeping curves, impressive size and offset bathing area mean you’ll need an awfully good reason to get out. It’s longer, it’s wider, it’s luxurious, and it just begs to be shared.